JOHNSTOWN, OH – An off-duty paramedic was lost in a terrible car crash on Friday, February 5, 2016. The 19-year veteran paramedic was rushing to the hospital to be with his son, who had fallen through a plate glass window at school and been transported to the hospital. Charles “Chuck” McNabb was pronounced dead on the scene after being ejected from his car when it collided with a tractor-trailer on US 62 in Johnston, OH. Patrol officers on scene suspect that he was not wearing his seatbelt. 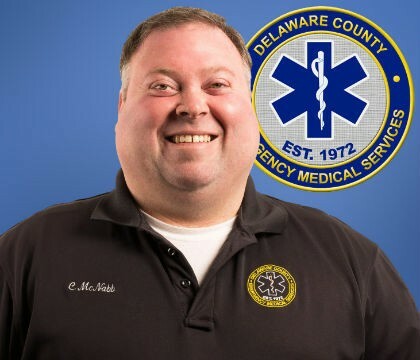 McNabb was a proud firefighter/paramedic for almost two decades with Delaware County EMS. “Please join the IAEP family in sending your thoughts and prayers to those touched by the death of Chuck McNabb. We are devastated by the loss of one of our own” states IAEP Director Phil Petit. Visitation will be Thursday, February 11, 2016 from 1-3PM and 6-8PM at Croton Church of Christ. Services will begin Friday, February 12, 2016 at 11AM at Croton Church of Christ, followed by internment at Croton Cemetery.